Welcome to the February One Stamp At A Time Blog Hop! Phew!!! Another weekend on its way!! If you got to me by way of Justin Krieger, I am so happy to have you here! I just loved Justin's creations this month! The Heart Shaker was definitely my favorite... I hope I am his Valentine.. This month our theme is "Love is in the Air". I can't wait for you to tour the whole hop to see what all my crafty friends have in store for you! We have a few new hoppers so make sure you tour the whole hop to see what we have all created! I was so excited to ink the new photopolymer set Grateful Bunch! To be honest, I just wanted the set for the lace border stamp but when I got it, I LOVED IT! Plus it has a coordinating punch!! Who can turn down a bundle?! Not this girl! 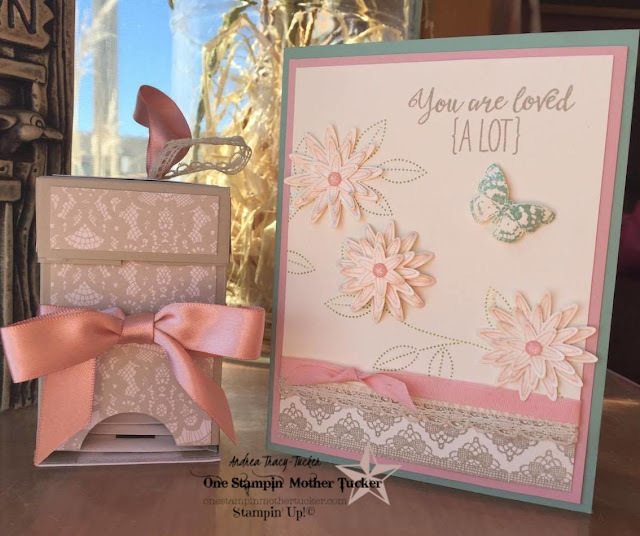 I inked up the border stamp in Sahara Sand and created the lace border pattern on the bottom of the Very Vanilla card stock. The lovely dotty leaf pattern is also from the same set. These are stamped with Pear Pizzazz ink. The cute little flowers were stamped with Blushing Bride ink. The stamp actually has all 3 flowers on it! I layered two of them up with Glue Dots and curled up the edges with my scoring tool. The center one I actually used Dimensionals between the layers to give it a little more depth. The centers of the flowers are the lovely little dots from the Love Blossoms Embellishment kit. I just couldn't resist the butterfly in this set! Yes, I wish it was a just a little bit bigger. Mint Macaron seemed to be the best color for this stamp onto the Very Vanilla card stock. I fussy cut it with a fabulous Paper Snips then shaped the wings a little with my bone folder. Like the lace at the bottom, I stamped the sentiment in Sahara Sand. The Blushing Bride cotton ribbon and Venetian Crochet Trim seemed to be just the right touch!. I matted this with Blushing Bride cardstock and adhered it to a Mint Macaron base. My tea bag holder I actually found on Pinterest. You can thank Vicki for the tutorial!Vicki Collins Mini Tea Bag Caddy Tutorial. I simply used Sahara Sand for my base with the Timeless Elegance DSP. The Blushing Bride satin ribbon is from the Love Blossoms Embellishment kit. I tied a simple bow around the box and the used it to make the handle at top with the crochet trim. Thank you so much for stopping by! Next is the talented Marisa Gunn! I am so excited for you to see her creations this month! She was so excited about the theme that she did it a month early LOL!! Andrea Tracy-Tucker You are here! Marisa Gunn <<She is next!! Love what you've done with this set!! So soft and pretty! That lace border is to die for!! Can't wait to try it out! Thanks for sharing!!! Such cute dainty projects. I love them both and the colors are so soft. Great job! Wow... you've outdone yourself! Loved them! Beautiful projects Andrea I love them and will be stealing the lace border idea it's just gorgeous ! LOVE vintage and rustic...each of your projects are amazing!! Love the details you put into your flowers and butterfly. Adorbs! Both card & project are beautiful! I'm going to have to CASE your card as that is one of my favorite new sets! So soft and pretty! I love the flowers! The Timeless Elegance DSP coordinates so beautifully with the lace boarder stamp! Lovely. So pretty ad feminine. I think I know a few people who might love that little tea bag holder for Mother's Day.... hmmm.... thanks for the idea! Oh, man. I am normally not a pink girl but I love your stuff so much! I have yet to use that stamp set it (I do have it) and now I am totally inspired to go play with it. I may just do it in pink too. I am a tea fanatic and that tea box is to die for. I love your color and DSP choices and the venetian trim is absolutely perfect. You nailed all of the details with these ones Andrea. Thanks for the inspiration! Sweet little gift ensemble! I have a friend whose birthday is next week and she LOVES tea - thanks for the inspiration! i just can't get over how adorable that tea bag box is and that wonderful card! you always do such amazing work. Really elegant card and tea holder. I love how you used the lace elements across both projects!